Being a Caveman and all, I love to put meat on the grill or in the smoker. That said, I must challenge the purists who insist that good Pulled Pork has to be cooked via one of those methods. This recipe will prove that this dish doesn’t always have to be made in the great outdoors. Make one preparation BBQ Rub-a-dub. 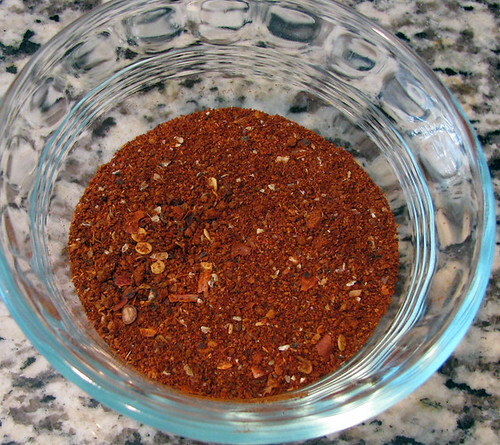 HINT #1: This rub was developed specifically for this recipe. Completely cover entire Pork shoulder with rub. 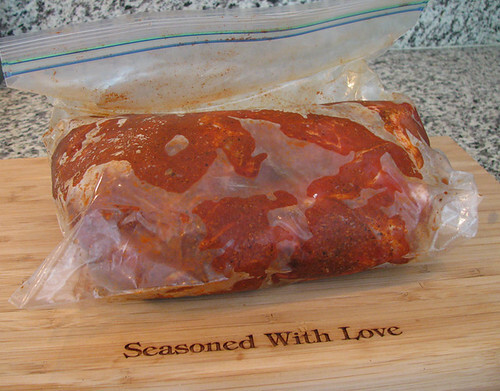 Place into large zip-loc bag and press rub into meat. Seal bag and place in refrigerator for at least 12 hours (I go for 24). When done marinating, remove meat from fridge and let stand for 20 minutes. Preheat oven to 300°. In the meantime, slice onion and then cut slices in half. Slice garlic cloves lengthwise. Evenly spread half the onions and garlic in the bottom of a quality Dutch Oven. Place the Pork should on top of the onion and garlic slices, then cover with the meat with the rest of them. Place lid tightly onto Dutch Oven and put into oven. 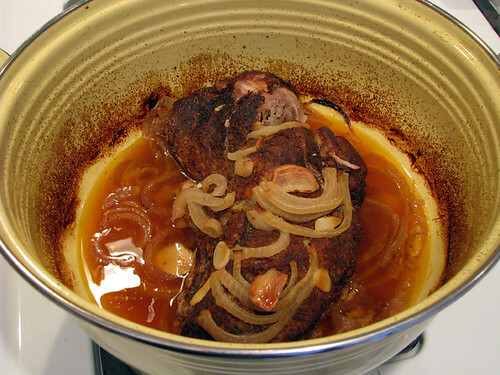 Pork shoulder should cook for about 1.25 hours per pound. To be certain it is fully cooked, insert a meat thermometer (be sure it isn’t touching, or near, any bones). Meat should be done when it reaches 175°. 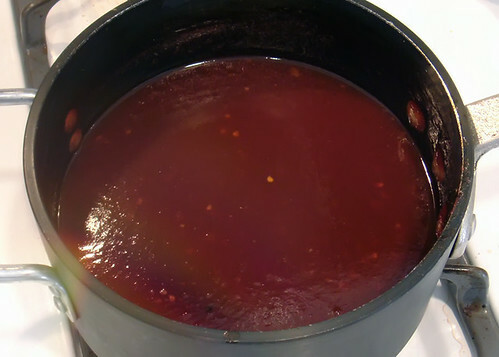 While meat is cooking, make one preparation R&R BBQ Sauce. HINT #1: This sauce was developed specifically for this recipe. When the meat is done, it should look something like this. NOTE #1: See, purists. There is still a nice bark on the outside! Scrape any loose onion or garlic slices off Pork shoulder into Dutch Oven (don’t worry if some sticks to the meat). Remove meat from Dutch Oven, place onto a raised edge plater (to catch any juices that may flow in the pulling process), and let stand for 15 minutes. Skim fat from juices that remain in pan and reserve any remaining liquid, onions and garlic. Take two forks and start shredding meat, making sure to separate and discard any fat and/or bones. NOTE #2: See, purists. The meat is still juicy and tender! Place remaining meat, drippings, and onion/garlic scraps back into Dutch Oven with reserved liquid and ingredients. Pour in 2 to 2.5 cups of the R&R BBQ Sauce (depending on the size of the Pork Shoulder), and stir all ingredients together. Place lid back onto Dutch Oven and return to oven for 15 minutes. Now you’re ready to serve up this succulent, juicy, tender, and delicious Pulled Pork. One option is to heat up some corn tortillas, whip up some Rockin’ Guac, and make some Tacos al Pastor. You can also steam up some rice and pour ladles of this marinated, slow-cooked pork on top. 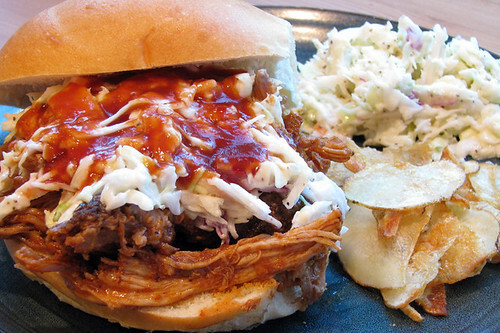 But, the overwhelming alternative of choice is to slice open a Kaiser Roll, slap on a heap of the Pulled Pork, top with some Cole Slaw, and drizzle with warmed R&R BBQ Sauce, as shown here. Also, served here with some Oven-Baked Cave Chips. NOTE #3: See, purists. It still looks delicious! If you are wondering whether it really tastes as good as it looks, just ask the Caveboy. He declared this stuff to be, during his one and only pause between bites, his “new, personal candy”. But, don’t take our word for it … try it yourself! View the C3TV video version of this recipe here. ©2010 Caution: Caveman Cooking/UHearMe, Inc. All rights reserved. This recipe originally appeared on the Caution: Caveman Cooking blog at https://cavemancooking.wordpress.com authored by Caveman. This recipe may be shared and reprinted as long as this entire copyright message accompanies it. This entry was posted on September 28, 2010 at 5:55 AM	and is filed under Main Course, Sandwiches. Tagged: cooking, food, garlic, onion, pork, pulled, sandwich, sauce. You can follow any responses to this entry through the RSS 2.0 feed. You can leave a response, or trackback from your own site. Now this looks yummy! I swore we were going to make this over the summer in the smoker, but our time got away from us and we never got around to doing it. Glad to know it works just as well on the stove! BTW, I made those potato chips the other night as a side to our pork tenderloin. They were delicious and my family loved them. Seasoned them up with a sprinkling of smoked paprika, salt and pepper, and a little cayenne on the ones for me and hubby. My camera was acting up and I never got shots of the tenderloin or the chips, but they will be on the menu again and I’ll be sure to pass on the credit to you! Now, pass me a bun and some pork! Glad you liked the chips, Pam. Can’t wait for you to try this … it is gooooooooooood! Cool! Let us know how it goes, Katie. Good luck with the F&W!! Pork shoulder has got to be the most under-rated cut going. Enough with the bacon and bellies. This is where the flavor is. Couldn’t agree more, Janice. Throw in that Root Beer & Rum BBQ sauce and the flavor level goes off the charts! Actually, Chris, the rub gives it a nice smokey flavor. Granted, not as pronounced as actually putting it in a smoker. But, I bet you’d be surprised! This looks wonderful. 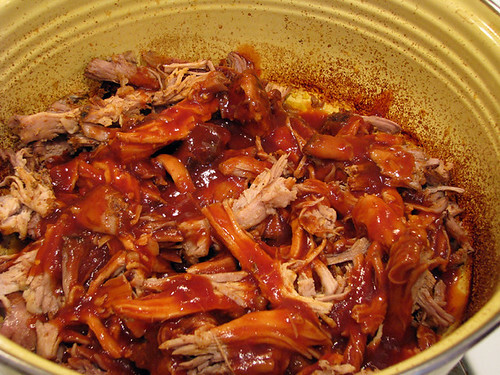 I’m going to admit that I’ve cooked a lot of things but never pulled pork…and I love it. I might just have to give your recipe a try. Thanks, Cheryl! Let us know how it goes if you do make it. BTW, this really goes well with football … if you are watching any games this weekend. I’m hungry and I want this NOW! I love your step by step pictures. This looks sooooo yummy. For the past year I have been on a mission to perfect a pulled pork recipe. This looks fabulous. Your step-by-step photos are great. Looks like I know what I’m cooking this weekend!!!! Thanks, Jess! Please, let us know how it goes for you. Thanks, Ryan! It really is. In fact, we had some for Xmas Eve dinner … it was amazing! This looks and sounds wonderful! Can’t wait to try it out. Go for it, Sandy! You’ll be glad you did!! Followed this recipe and it was awesome. Super easy and highly recommended! Thanks, Alex! Glad you liked it!! We have a bunch of other killer, yet “easy” recipes here … give ’em a try when you have a chance. Thanks, Robert! It’s always a good idea to put your own spin on a recipe. Glad it worked out so well! SaWEEEEEET! Kit, if you don’t have the home-grown goods, give the ingredients here a try. I think you and your friends might like it!